Why do we eat ham at Easter? The answer is below. But eat we do! 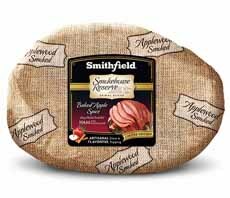 Smithfield sent THE NIBBLE its latest flavor, Smokehouse Reserve Baked Apple Spiced Spiral Sliced Ham (the flavor refers to the glaze packets that are included. Weighing in at more than five pounds, we served it last night at our monthly editorial dinner. The ham was so juicy, so easy to prepare (precooked, it needed only 90 minutes of heating) that two more team members are buying spiral-sliced Smithfield hams for Easter dinner. Each pound of spiral sliced ham contains approximately 4 servings, so our group of nine went home with leftovers, planning how to use them today. WHY BUY A SPIRAL SLICED HAM? Spiral sliced hams were created because bone-in hams are traditionally hard to slice. The slices are created with a machine at the plant or butcher, by slicing a bone-in ham in one continuous spiral. The technique leaves the ham on the bone in its original shape, but easy to remove and serve. A friend with a ham habit recommends a spiral sliced ham with the bone in. He likes the greater juiciness of a bone-in ham, the ham bone for further culinary use (see the next section), and the convenience of the spiral slices. Our mother, a purist, preferred the uneven slices and carved her own ham. So it becomes a question of aesthetics and time (and skill) to carve. If a large group of hungry people wants their ham ASAP, go for the spiral. 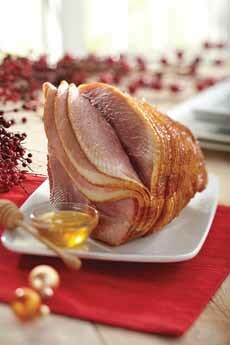 A spiral ham also looks prettier standing up, with the slices fanned. Smithfield hams are sold fully cooked and can be heated or eaten cold or room temperature. In fact, we spent so much time last night with the courses leading up to the ham, that we ended up with room temperature ham after our baking ham had cooled. It was just as yummy. Spiral ham trivia: The spiral-slicing machine was patented in 1952 by Harry J. Hoenselaar, who went on to founded HoneyBaked Ham a few years later. His creation eliminated the frustration of navigating the ham bone and producing even slices. Here’s more on the spiral-slicing machine. Smithfield spiral sliced ham, packaged (photos #1 and #2 courtesy Smithfield Foods). On an Easter table (photo courtesy Today I Found Out). Except for the those marked boneless, all hams include a bone, which can be used to add smoky ham flavor to other dishes. If you don’t want to use it, ask a friend: Few good cooks will turn down a ham bone! You can freeze a ham bone; you can substitute a ham bone for any recipe that calls for a ham hock. Freeze: If you don’t have much time to think about it, wrap the bone tightly in plastic, and plan to use it within three months. Ham Stock: If you have just a little time to think about it, place the bone in a 4 or 5-quart pot with water, carrots, celery, garlic, herbs (bay leaves, parsley, thyme), onions or leeks, and 5 peppercorns (The water should cover the bone by one inch). Bring to a boil; reduce the heat and simmer, uncovered, for 3 hours to extract the most flavor from the bone. Stock is typically left unsalted, for flexibility in recipes. When finished, discard the bone and strain out the vegetables. Beans: A pot of beans or legumes of any kind (the difference), will be even more flavorful when cooked with the bone. Make a big pot of beans and enjoy them all week in different forms: baked beans, bean dip, grain bowls, green salad, sandwich spread, tacos and burritos, for starters. Congee: We love Cream of Rice porridge, and breakfast on it regularly. The Chinese version is called congee, served as a savory dish with scrap bits of meat and vegetables, and sliced scallions. Find a recipe and cook up a pot. Maybe invite friends and neighbors to brunch? If so, see if you can find a Chinese sausage to add to the congee: a wonderful flavor very different from American and European sausages. Greens: The classic is collards with a ham bone. If you’ve never made this delicious dish, head to the store for the collards! You can substitute kale and chard. Soups & Stews: Ham bones are added to hearty, slow-cooked soups: bean soups, chowder, lentil and split pea are the most popular. Don’t leave a ham bone where a dog can get at it: Cooked bones can splinter and get stuck in their throats. The paschal lamb or an easter ham? Lamb is a traditional Easter food because Jesus’ last supper was the Passover meal, which includes a ritually sacrificed lamb. In Europe, lamb is commonly served at Easter, based on the tradition of the Passover feast, and fitting commemoration of Jesus, the “lamb of God,” who, as a Jew, would not have eaten pork. 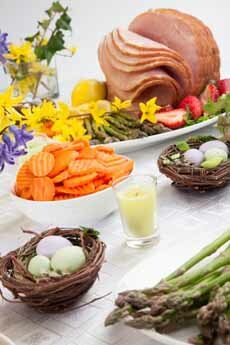 So why is ham so often served at Easter? Convenience: Prior to modern times, salted pork would last through the winter and ham would be ready to eat at Easter, before other fresh, quality meat was available [source]. Before refrigeration, pigs and cows were slaughtered in the fall. Since it took a fair amount of time to butcher these large animals without modern tools, the cold winter temperatures helped to keep the meat from going bad before it could be properly aged to develop their flavor [source]. By Jewish law, the sacrificial lamb could be up to a year old. Sometimes, based on how the dates fell for Passover and Easter, spring lambs born 6 to 8 weeks earlier could be slaughtered for the holiday. 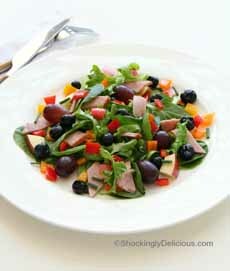 Transform leftover ham into a colorful salad, packed with fruits, vegetables and ham chunks. This recipe, featured by Smithfield, is copyright Dorothy Reinhold, Shockingly Delicious. Preparation1. CHOP the bok choy into bite-sized pieces. Place in large bowl or plate.2, CUT the apple into quarters, removing core, and cut it into chunks to add to salad. Add grapes to salad. Cut 1-2 slices of ham into strips and add to salad. Cut mini peppers in half, removing stem and seeds. Cut into small chunks and add to salad. Add blueberries to salad. 3. DRIZZLE the olive oil on salad, followed by the vinegar. Using a kitchen shears, snip chives in tiny pieces atop the salad. *You can substitute any apple you have. Fuji apples are sweet, juicy and crisp with an undertone of spice. It can be yellow-green with red highlights to mostly red in color. It is a cross between two American varieties, the Red Delicious and the Ralls Jennet, a popular breeding apple that was grown at Monticello by Thomas Jefferson. The Fuji apple was developed in Fujisaki, Japan in 1939 but wasn’t introduced to market until 1962 in Japan, and not until the 1980s in the U.S., where it has become one of the the country’s favorite apples. †Most of us haven’t infused a vanilla bean in olive oil. Substitute any flavored oil you have: basil, garlic or rosemary.